Our adoptable animal for January is Emma! 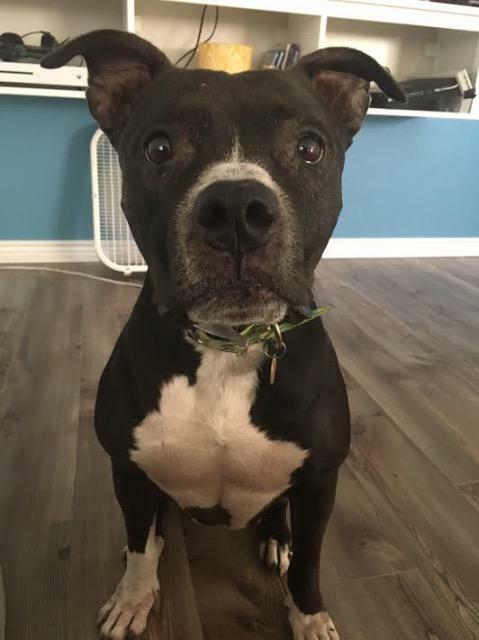 Looking for love and a nice couch to snooze on… Emma is a 5 year old, 50 pound Pit Bull. Emma loves to meet new people, especially if they have treats! She gets the zoomies when she is excited to see you and will race around the house when you come home. Emma does well with other dogs, but needs proper introduction and time to decompress to live happily. Tug of war is her favorite game, next to a good wrestling match with the other dogs! Emma likes to snuggle and sometimes forgets that she isn’t a tiny lap dog! Emma does not like cats. She LOVES kids and is very calm even around high energy. Emma walks beautifully on leash and is very in tune to her handler. She is house and crate trained. She has some food allergies and will need to be on a high quality food and daily medication. Her allergies are not anything to be concerned by! There are many foods in varying price points that she does well on. Emma is an easy going girl once settled into a new environment. She needs a little patience and a lot of love, and when given those, Emma will gladly be your soulmate and couch-mate for years to come. *Dogs are not placed on a first come first serve basis. CAWS strives to find the perfect home for each animal. Applications may take up to 48 hours to process.